This silver finish stretch bracelet has a heart charm that says 'Serenity Prayer' on it. 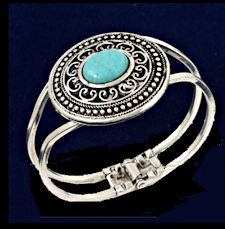 The bracelet is in four quarters, and stretches to be easier to fit. 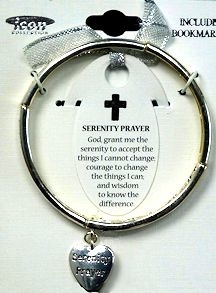 A bookmark with a silver bowtie ribbon and the Serenity Prayer verse is included. God grant me the Serenity to accept the things I cannot change, Courage to change the things I can; Amd wisdom to know the difference. This product was added to our catalog on 10/01/2018.